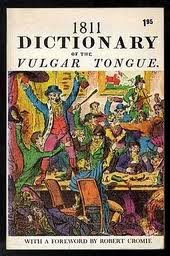 More fun with 19th century slang and cant, courtesy of that giggle-worthy compendium of all bygone bad language, the 1811 Dictionary of the Vulgar Tongue. Enjoy! Isabel was in a tweague because the chitty-faced fresh milk dangling after her choused her while he was chirping merry. I love tweague. I will have to use it sometimes regardless of the confusion it will likely engender. Tweague is pretty wonderful. There are so many words in the 1811 Dictionary that deserve to be in use again.